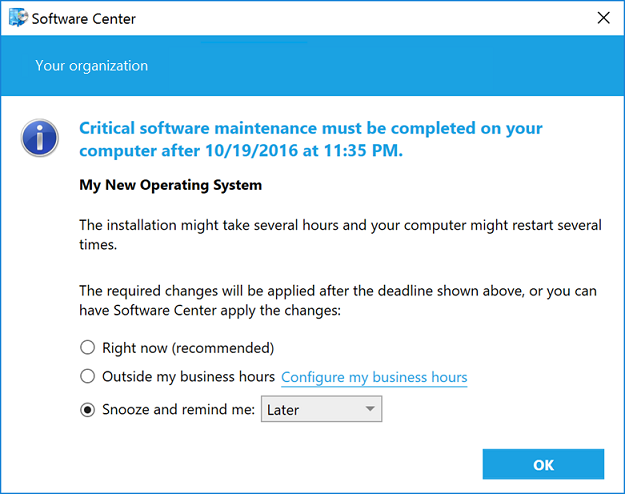 This article introduces the features that are available in the Technical Preview for System Center Configuration Manager, version 1610. You can install this version to update and add new capabilities to your Configuration Manager technical preview site. Before installing this version of the technical preview, review the introductory topic, Technical Preview for System Center Configuration Manager, to become familiar with general requirements and limitations for using a technical preview, how to update between versions, and how to provide feedback about the features in a technical preview. 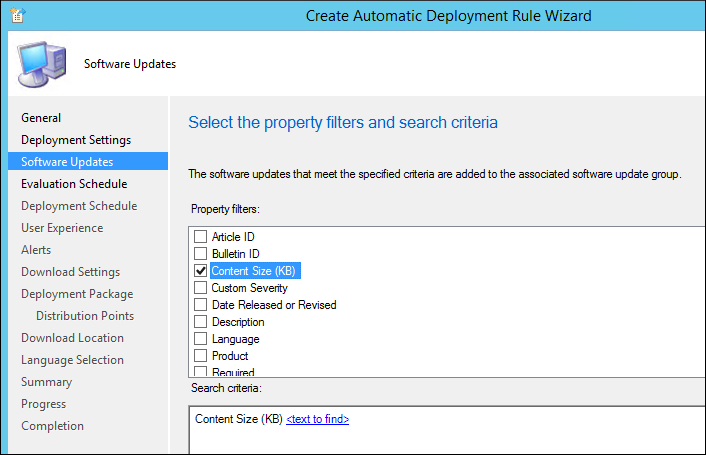 You can now filter on the content size for software updates in automatic deployment rules. For example, you can set the Content Size (KB) filter to < 2048 to only download software updates that are smaller than 2MB. Using this filter prevents large software updates from automatically downloading to better support simplified Windows down-level servicing when network bandwidth is limited. For details, see Configuration Manager and Simplified Windows Servicing on Down Level Operating Systems. To configure the Content Size (KB) field, go to the Software Updates page in the Create Automatic Deployment Rule Wizard when you create an ADR or go to the Software Updates tab in the properties for an existing ADR. Later: specifies that notifications are scheduled based on the notification settings configured in Client Agent settings. Fixed time: specifies that the notification will be scheduled to display again after the selected time. For example, if a user selects 30 minutes, the notification will display again in 30 minutes. The maximum snooze time is always based on the notification values configured in the Client Agent settings at every time along the deployment timeline. For example, if the Deployment deadline greater than 24 hours, remind users every (hours) setting on the Computer Agent page is configured for 10 hours, and it is more than 24 hours before the deadline when the dialog is launched, the user would be presented with a set of snooze options up to but never greater than 10 hours. As the deadline approaches, the dialog will show fewer options, consistent with the relevant Client Agent settings for each component of the deployment timeline. As an administrator you can now deny a previously approved application request. Once denied, to install this application later users must resubmit a request. Denial does not uninstall the application; rather it forces reapproval for any new request for that application from that user. Previously, application request denial was only available for application requests that had not been approved. In the Configuration Manager console, create and deploy an application that requires approval. On a client computer, open Software Center and submit a request for the application. In the Configuration Manager console, approve the application request. Deny the approved application request: In the Configuration Manager console, navigate Software Library > Overview > Application Management > Approval Requests and select the application request you want to deny. In the ribbon, click Deny. 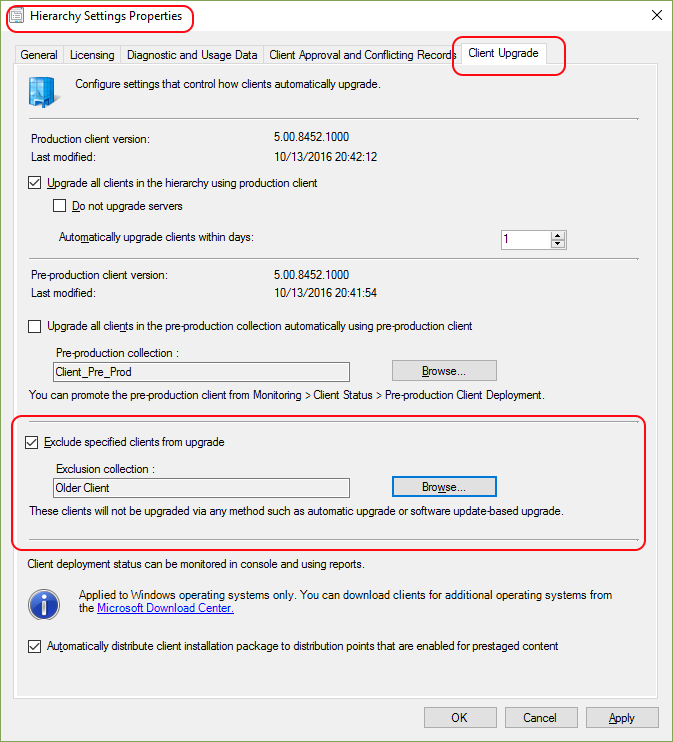 Technical Preview 1610 introduces a new setting you can use to exclude a collection of clients from automatically installing updated client versions. This applies to automatic upgrade as well as other methods such as software update-based upgrade, logon scripts, and group policy. This can be used for a collection of computers that need greater care when upgrading the client. A client that is in an excluded collection ignores requests to install updated client software. In the Configuration Manager console open Hierarchy Settings under Administration > Site Configuration > Sites, and then select the Client Upgrade tab. Select the checkbox for Exclude specified clients from upgrade, and then for Exclusion collection, select the collection you want to exclude. You can only select a single collection for exclusion. Click OK to close and save the configuration. Then, after clients update policy, clients in the excluded collection will no longer automatically install updates to the client software. You can now configure Windows Defender client settings on Intune-enrolled Windows 10 computers using configuration items in the Configuration Manager console. These settings can only be configured on client computers running Windows 10 November Update (1511) and above. In the Configuration Manager console, go Assets and Compliance > Overview > Compliance Settings > Configuration Items, and create a new Configuration Item. Enter a name, then select Windows 8.1 and Windows 10 under Settings for devices managed without the Configuration Manager client and click Next. Ensure All Windows 10 (64-bit) and All Windows 10 (32-bit) are selected on the Supported Platforms page, then click Next. Select the Windows Defender setting group, then click Next. Configure the desired settings on this page, then click Next. Add this configuration item to a configuration baseline, and deploy this baseline to computers running Windows 10 November Update (1511) or above. Remember to check the Remediate noncompliant settings checkbox when deploying the configuration baseline. You can now request a policy sync for a mobile device from the Configuration Manager console, instead of needing to request a sync from the device itself. Sync request state information is available as a new column in device views, called Remote Sync State. State also appears in the Discovery data section of the Properties dialog for each mobile device. In the Configuration Manager console, go Assets and Compliance > Overview > Devices. In the Remote Device Actions menu, select Send Sync Request. Sync can take five to ten minutes. Any changes in policy are synced to the device. You can track the state of the sync request in the Remote Sync State column in the Devices view, or in the device's Properties dialog. Read-only access to these areas of the Configuration Manager console is still granted to the Read-only Analyst role. You can now require Windows 10 devices enrolled in Azure Active Directory to be compliant in order to have VPN access through Windows 10 VPN profiles created in the Configuration Manager console. This is possible through the new Enable conditional access for this VPN connection checkbox on the Authentication Method page in the VPN profile wizard and VPN profile properties for Windows 10 VPN profiles. You can also specify a separate certificate for single sign-on authentication if you enable conditional access for the profile.